Most of California has a Mediterranean-type climate with cool, rainy winters followed by hot, dry summers. Many of the plants for sale in nurseries need help to survive in this climate, and often require a lot of water during the summer. 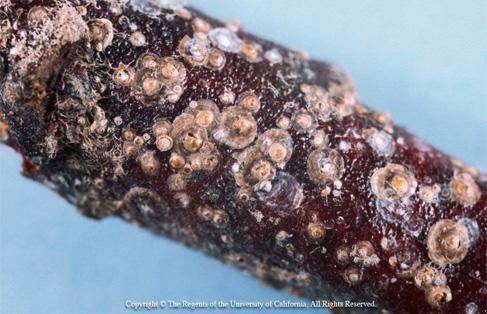 However, plants native to California (meaning that they were present prior to the arrival of European explorers and colonists) have adapted to this climate with a variety of strategies that allow them to live with no water for long periods of time. One of these strategies is to bloom and grow during the rainy season and go dormant during the hottest part of the summer. Manzanitas (scientific name Arctostaphylos) are one group of California natives utilizing this strategy. Their small, urn-shaped flowers, appearing during winter, range from white to pink and are followed by reddish fruits resembling tiny apples. In fact, the word manzanita is Spanish for “little apple.” Manzanita flowers are a good source of food for bees, butterflies and hummingbirds, and many other birds eat the fruit. Manzanitas come in a wide variety of sizes and growth habits, from groundcover to tree-like, but all are evergreen, with leathery leaves and smooth, mahogany-colored bark providing year-round interest. They generally require good drainage, enough space around them to allow for good air circulation, and little to no summer water. The cultivar ‘Howard McMinn' is a manzanita (photo) that does very well in home gardens. It can tolerate heavier soils, summer watering, partial shade and light shearing. Pale pink flowers begin blooming around February. It has fine-textured green leaves and grows to a more rounded form than other manzanitas. 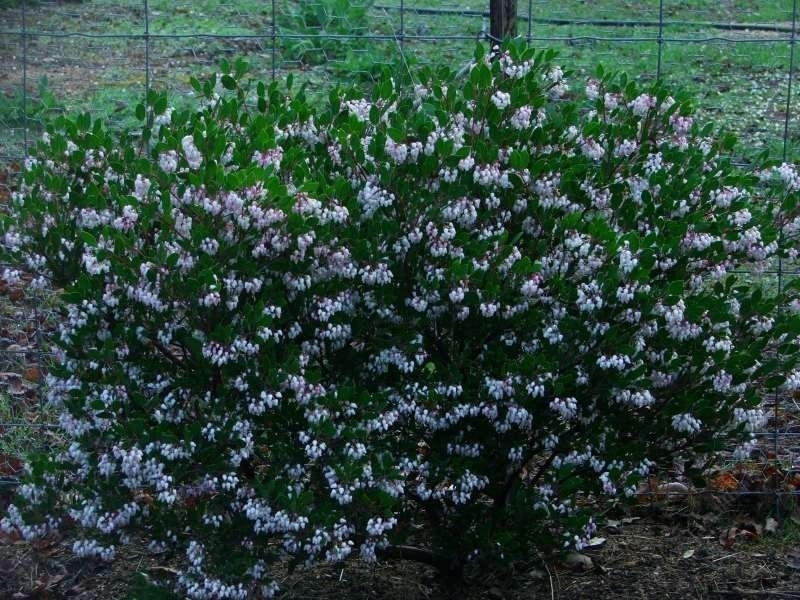 It grows to medium size (about four to six feet tall), making it a good choice for a foundation shrub or an informal hedge. Another reliable manzanita for this area is the cultivar ‘Dr. Hurd.' It grows from ten to fifteen feet tall and as wide and can be pruned as a small tree. The contrast between the dark reddish bark on the spreading branches and the gray-green leaves is quite striking, becoming even more beautiful with age. White flowers bloom in the winter. ‘Dr. Hurd' prefers full sun and little summer water although it can tolerate some irrigation and heavier soil. 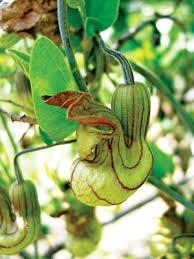 Pipevine (scientific name Aristolochia californica) is native to foothills and valleys of northern California. It grows in both lower and upper Bidwell Park, usually near water. Its ten to fifteen-foot-long vines climb into shrubs or trees or along fences without harming them. Blooming in winter or early spring before its heart-shaped leaves appear, the pale green flowers with dark maroon veins are unusual in appearance, resembling curved pipes with flared bowls. It is the only local larval host plant for the pipevine swallowtail butterfly. Pipevine tolerates just about any soil but needs part to full shade and a little water in summer. While it can be grown as a groundcover, pipevine is most effective where the flowers can dangle at eye level to be appreciated. Planting winter-blooming natives in your garden provides both food for wildlife and lovely flowers to enjoy when most of your garden is dormant. As days shorten and temperatures cool, the pace of gardening slows along with plant growth. But there is still plenty to be done during the fall and winter months. In fact, much of what is done in the garden now will set the tone for the following year. Cleaning up the garden is an important chore. Remove any dead plant material from the garden and add it to your compost pile. Pick up any fallen fruit from around fruit trees. These actions will eliminate habitat for overwintering diseases and pests. Rake up leaves. Matted leaves left on a lawn can suffocate it. Instead, add your leaves (chopping up the largest ones) to your compost pile. If you delay dead-heading your spent flowers and seed heads until early spring the birds will appreciate having this extra source of food during the lean winter months. Prune deciduous trees and shrubs during their dormant period. However, it is worthwhile to do a little research on each plant to become familiar with its pruning requirements. 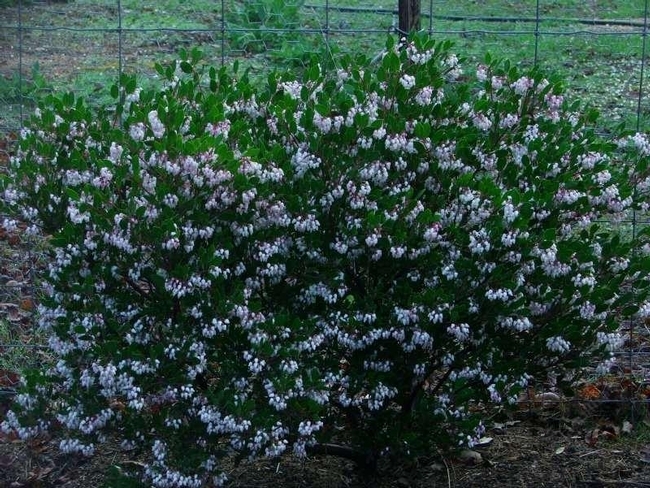 For example, pruning early-flowering plants such as azaleas, flowering quince, or forsythia in the fall will remove flower buds and reduce the spring flowering display. If these plants require pruning, it should be done just after they have finished blooming. Consider planting a winter garden. Radish, spinach, pea and onion seeds can be planted in October or November. Cauliflower, broccoli, lettuce and turnip seedlings can be planted in November. If you don’t want a winter garden, clean up your summer garden and mulch it with straw, grass clippings or chopped leaves. Mulch will discourage weeds and provide soil nutrients for next year’s garden. Planting bare root trees and shrubs during their winter dormancy allows healthy root systems to develop before budding out in the spring. Fall is also the time to plant bulbs and perennials. Squirrels can notice disturbed soil and may dig up tulips and other bulbs. Disguise your work by flooding the soil surface with water and then covering the soil with mulch. Renovate garden beds by weeding, adding organic matter, and tilling the soil to a depth of at least six inches. Refresh existing mulch around established plantings. Conduct an irrigation review and adjust your watering schedule to reflect the lower water requirements of fall and winter. Make any repairs (such as fixing broken pipes, hoses, or damaged sprinkler heads) before spring. If you have an automatic system, be sure it is operating correctly. If you plan to create new garden beds, fall is a good time to do it before you are faced with the rush of spring gardening jobs. And if you plan on creating a new bed in an existing lawn area, a good method is to cover it with a thick layer of newspaper topped with a layer of mulch. This will kill the lawn (as long as it’s not a dormant perennial like Bermuda grass) and the bed will be ready to be worked in early spring without the effort of manually removing the sod. Finally, clean and sharpen your tools. Keeping tools clean helps prevent the spread of disease and prolongs the life of the tools. If you prune diseased plants, disinfect clippers, loppers or saws with a diluted bleach solution, blot them dry, and then apply a light coating of oil. Sharp tools produce clean cuts and clean cuts heal more quickly. If you have empty flower pots that you are planning to reuse, clean them by removing dirt with a coarse brush and then rinsing with water. Let terra-cotta pots dry completely before storing them. Just because it is wintertime doesn’t mean that bees, which are important pollinators for our flowers, fruits and vegetables, don’t need food. Plants and shrubs can provide pollen, nectar, or both to bees in our late winter and early spring. 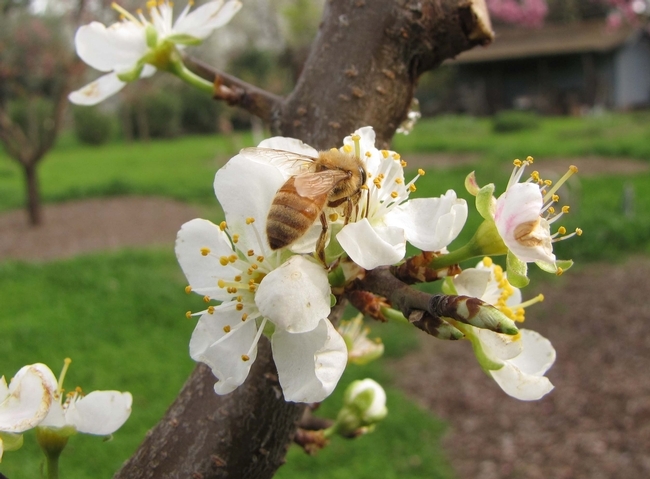 Honey bees will be brought to Northern California from all across the US to begin pollinating the almond crop by mid-February. Although almonds don’t have a lot of nectar, they do have a lot of pollen, which allows the bees to build up the strength of their colonies after the arduous journey of travelling across the country. Honey bees can forage as far away as three to five miles from their colony when conditions are favorable for flight, although most foragers tend to stay within a few hundred yards of the colony if it is near adequate food rewards (nectar and pollen). Honey bees will venture out from their hives when temperatures reach the mid-50s Fahrenheit; they won’t travel far, but they will search for sources of pollen and nectar nearby. Because honey bee queens are constantly laying eggs and raising their young, these bees need food year-round. Honey bees forage when temperatures are 55 degrees and higher; they do not forage in rain or in wind stronger than 12 miles per hour. Cloudiness also reduces flight activity, especially near threshold temperatures. A honey bee normally flies at a speed of 18 miles per hour empty and 15 miles per hour carrying of load of pollen or nectar. However, if they are agitated and empty, honey bees can fly about 20 miles per hour. They cannot carry a load upwind against much more than a 15 mile-per-hour wind. Native bees, like bumble bees and mason bees, are solitary and do not live together in hives like honeybees do. Solitary native bees were here long before the arrival of honey bees, which were introduced from Europe in the early 17th century. Native bees lay their eggs throughout the summer and fall and their pupae (young) develop in seclusion during the colder months. They need daytime temperatures of 65 to 70 degrees before they emerge as adults, so they will not begin pollinating until early April, or when daytime temperatures rise. While native bees do not play a significant role in almond pollination, they are critical in pollinating many of our summer fruits, vegetables and flowers. Different species of pollinators are attracted to different types of flowers (generally those that suit their tongue length), but nearly all types of bees show interest in blue, yellow and ultraviolet hues. You can help bees out by planting mustards or clover as a cover crop – yellow mustard is one of the earliest blooming flowers that are attractive to honey bees. Native plants and shrubs that are attractive to bees include the California wildflower “Baby Blue Eyes,” and California Desert Bluebells, both of which are annuals; and California Dutchman’s Pipe, an attractive deciduous vine festooned with cream-colored flowers that have red-purple veins. Non-native plants that are bee-friendly in our area include flowering quince, which is often the first noticeable flowering shrub of the year; the popular evergreen camellia japonica, some varieties of which bloom as early as November; and witch hazel (hamamelis), a yellow-flowering shrub with a distinctive fragrance and intriguing blossoms. Crocus and hyacinth bulbs are also attractive to bees. These should be planted in November or December after spending 10 weeks chilling in a refrigerator ahead of time (as our climate is too mild to provide them the requisite chill hours) – and, like tulips, these are best treated as annuals in our climate. When doing your winter garden clean-up, keep the bees in mind: leave some “wild,” messy areas in your yard for bees. For example, old fence posts, dead logs, and decaying sunflower heads all provide native bees with places to hide, nest, and raise their next generation. Keep other pollinators in mind, too: for instance, instead of using a hummingbird feeder which you might only sporadically keep filled, provide natural nectar at this time of year by planting camellias, flowering quince and flowering currant.